Supernatural returns to the MacGuffin hunt leading Sam and Dean to a mysterious woman shackled up in a Men of Letters basement since the 1920s. After last week‘s excellent diversion it’s time to get back to the main plot which means that the brothers are in full research mode. 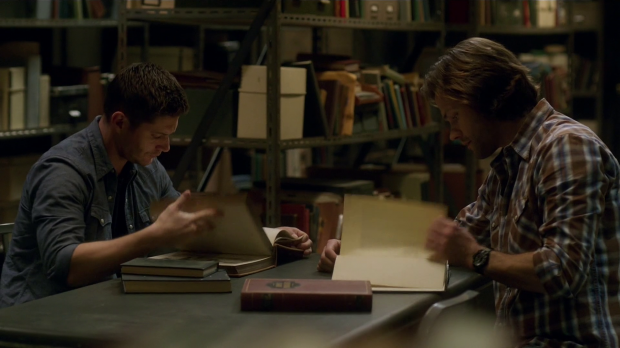 Dean finds the prospect of more research to be frustrating which allows for some really fun brotherly bickering along with a return to immature pranks. Dean covering Sam’s back in childish post-its was a lot funnier than it had any right to be thanks to Jensen Ackles’ hilarious facial expressions. Moments like this are always welcomed because it cuts through the darker plotting to deliver some fun and reminds the audience that Sam and Dean are brothers who don’t always get along. For the most part the episode plays out as a fairly typical Supernatural episode with research, a trip to some backwater corner of the United States and a situation that quickly gets out of hand. This isn’t necessarily a bad thing though it does feel somewhat formulaic to begin with which is expected for a show that has run so long. The problem with it is that the setup wasn’t all that interesting and the episode doesn’t manage to establish any real urgency which makes the plot itself feel unimportant at first. The discovery of Sandy (Magda Apanowicz) is both interesting and problematic. There is a mystery attached to why she was chained up by the Men of Letters and left there for nearly 100 years. Seeing the flashback of the rift opening and a tentacle coming through heading straight for Sandy adds to the intrigue as well. Sam and Dean’s approach to their discovery is problematic as they never question if there was a good reason for chaining Sandy up for nearly 100 years. She has lived an unnaturally long life while chained up so that’s strange in itself and something that Hunters with their experience should definitely have picked up on. Instead they free her and blindly assume that she is a victim of the Men of Letters. Even taking into account that Dean is a sucker for a pretty girl it’s still something that Sam should have protested. There was some fun to be had with Sandy trying to get used to the modern day. She gets a lot of information over a short period of time and seems overwhelmed by much of it. 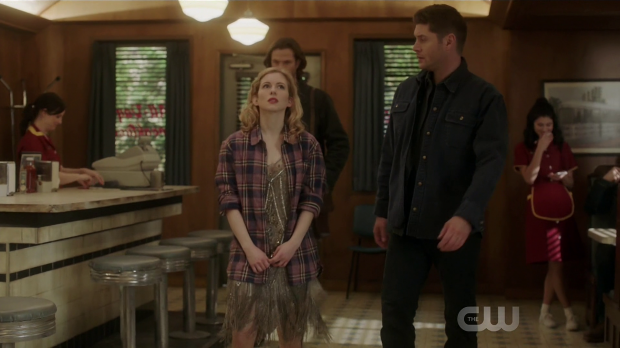 Despite their blind faith in her being a victim seeing Sam and Dean spend so much time trying to help someone was refreshing as it feels like a rarity at this point. They are both patient, understanding and compassionate which clearly proves to be comforting to Sandy as she adjusts to this new time period. Naturally it turns out that there’s more than meets the eye and the Men of Letters show up to punish the Winchesters for their stupidity. Sandy isn’t Human any more, she’s the vessel for an extra-dimensional God named Yokoth who wants to consume all life in the Universe after exhausting her own. Before doing this she wants to summon her mate so that they can consume the universe together. She chooses Dean as the host for her mate resulting in a climactic sequence that is devoid of any tension whatsoever. Supernatural has often leaned into humour but still manages to take itself seriously when it needs to. This definitely isn’t an example of its best work because Dean clearly doesn’t see the situation as a dangerous one considering he spends the whole time he is chained to the table making jokes. He’s probably very confident that Sam will rescue him but there should be some level of fear associated with the potential to become the host for a God that looks to consume all life in the universe. The lack of tension makes this whole plot feel disposable as the episode fails to establish Yokoth as any real threat. This is in direct contrast to Sam’s conversation with fellow Legacy Men of Letters members Ophelia (Tiffany Smith) and Marco Avila (Ivan Wanis-Ruiz ). They talk as if Yokoth is one of the worst things that our world has ever known yet she is dealt with so easily and the episode makes a big joke out of her threat level. This is in direct contrast to the way she is described to Sam and there is still no real punishment for the Winchesters freeing her without considering if that was the right thing to do. Ophelia and Marco are interesting characters that I would like to see again as they are similar to Sam and Dean in a lot of ways. They have also had their lives taken from them fulfilling a familial obligation that may or may not be of personal interest to them. Sam and Dean were robbed of their childhoods because they spent it going wherever their father took them. Ophelia and Marco are similar in that they have had to stay in one place to make sure that Yokoth doesn’t get free. The episode doesn’t really go into how they feel about it or what they will do now that the threat is dealt with but the comparisons that can be made are interesting and there is certainly room to develop that next season. Mr. Ketch and Asmodeus’ arrangement is further explored with Ketch realising that it’s not the deal he thought it was. Asmodeus is entirely self serving and sees Ketch as a resource that can be exploited for his own ends which naturally dents Ketch’s ego massively as he sees himself as an independent contractor rather than someone who is at the beck and call of others. His attempt to stand up for himself results in a really brutal beat down which confirms to him that he isn’t valued or respected. In true Ketch fashion he decides to look out for himself and realises that the Winchesters are his best hope for protection. He frees Gabriel and brings them the Archangel Blade as proof of his sincerity. I’ve always liked Ketch as a character and his actions in this episode remind me why I do. His presence serves as a reminder that not everyone is aligned to a side because that’s not how the world works. Some are only out for themselves and are helpful exclusively when they need something. 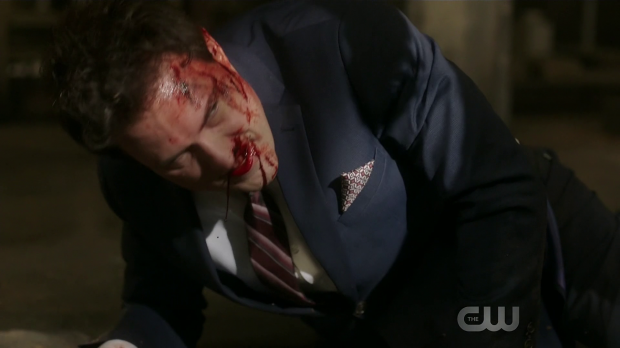 In this case Ketch needs protection from Asmodeus so decides to pledge his loyalty to Sam and Dean for the moment. They accept his offer because they know what sort of man he is and accept that he can probably be trusted at least for now considering what he has brought them. Characters like Ketch add complexity to the Supernatural universe which makes it all the more interesting. This episode brings an end to the MacGuffin hunt thanks to the help of both Ketch and the Men of Letters. Dean decides to head to the alternate world with Ketch in tow which is something Sam doesn’t understand at first. Dean’s reasoning is entirely sound as the portal is only open for a limited time and he needs someone he trusts to guard it as well as make sure everything in our world is taken care of. The arrival of Gabriel also means that someone needs to take care of him which means that Sam is of more use staying behind. Dean’s decision to take Ketch with him also makes sense. From his point of view he’s bringing along someone who is almost as skilled as he is while being completely expendable. He doesn’t want to risk Sam’s life and leave our world unprotected so Ketch is the logical choice. It does unfortunately mean that the brothers are separated once again but I do look forward to seeing another team up between Dean and Ketch as they are always entertaining. An uneven episode that furthers the main plot of the season but fails to build any tension in the climax. The background of the villain was interesting but the fact that Dean treated it as a big joke means that any jeopardy doesn’t really work. Sandy aka Yokoth only managed to be a threat because Sam and Dean fail to consider the situation of a woman chained up fully. The introduction of Ophelia and Marco was interesting as they also have childhoods that were taken from them inviting comparisons to Sam and Dean. Ketch was used well and his decision to ally himself with Sam and Dean instead of Asmodeus makes perfect sense for that character. Using Gabriel and the Archangel Blade to prove his sincerity is a good idea as well and I liked seeing his reaction to Asmodeus not valuing their partnership. Dean’s decision to take Ketch with him to the other universe also makes sense as Dean will consider him expendable and Sam can take care of things on his end as well as deal with Gabriel. This also means we get another Dean/Ketch team-up.